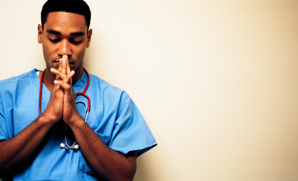 We pulled from many traditions to give you prayers that we hope will work for any nurse of faith. Find a prayer that’s helpful to you today from the list below. And please, share a prayer from your own life in the comments. Holy one, as we begin this day, I ask for your guidance. With your divine hand, Inspire, lead and give thy wisdom. Throughout this day, may your grace be ever present in this healing place. Let not your help be far away. We seek your strength and ask that you give spirit as we make decisions for the good. God of love, teach us to give our best, to speak with love and act with courage. May we be good stewards of all the gifts you have given. Amen.